Of all the four principle capital markets, the world of foreign exchange trading is the most complex and most difficult to master, unless of course you have the right tools! The reason for this complexity is not hard to understand. First currencies are traded in pairs. Each position is a judgment of the forces driving two independent markets. If the GBP/USD for example is bullish, is this being driven by strength in the pound, or weakness in the US dollar. Imagine if we had to do the same thing trading stocks for example. Consider trading Google against Amazon. If this ‘pair’ were rising, is this being driven by strength in Google or weakness in Amazon? Almost impossible to analyse. To compound this problem, every currency can be bought or sold against a myriad of other currencies. This raises the next key question. If the GBP/USD is bullish once again, is the British pound strong against all the other major currencies, such as the GBP/JPY, the GBP/CAD, the EUR/GBP etc. If it is, then this is clearly a sign that the UK pound is being bought universally in the market. Equally for the US dollar, if it is sold universally in pairs such as the USD/CAD, the USD/JPY and others, then we can assume that the GBP/USD is rising as a result of strong buying of the pound universally, and strong selling across the market of the US dollar. Finally, we come to the third problem, which is trying to assess the strength of this buying or selling. After all a currency may be overbought (strong) or oversold (weak) but how strong is strong, and how weak is weak. Trading success is all about assessing risk and the probability of success on each trade. Would this information give you a high risk, medium or low risk trading position? And the answer……… is a low risk trading opportunity. After all, you are now taking a position based on a view across the market. First, if you are basing your decision on universal buying or selling of a currency, then you are trading with the entire weight of the market, and not just on the analysis of one currency pair – it’s low risk. Second, if you know the relative strength of this buying or selling against all the other currency pairs, then this gives you the complete picture – if its strong, then again – it’s low risk. Third and last, if you know what the counter currency is also doing in terms of strong or weak, then once more if its strong – it’s low risk. This is where the Quantum Currency Matrix steps in. It provides the solution to all three problems in one elegant indicator. It shows you the complete picture across the market in a simple matrix, which works in all timeframes from 1 minute to 1 month. From the eight major currencies come the 28 currency pairs which are then displayed in a table, with their relative strength scores, updated second by second and minute by minute. As you can see, the Currency Matrix displays the complete spectrum of currency pair strength, from very bullish at the top of the matrix and bright green, to heavily bearish at the bottom of the matrix, and bright red. Those currency pairs moving up or down the ladder from bullish to bearish or bearish to bullish are then shaded in the transitional colors of orange, and yellow to light green. Every pair is displayed with a ranking score. Above 0.00 indicates the pair is moving into a bullish phase, whilst a score below 0.00 indicates bearish momentum is increasing. Each currency can then be isolated to show the 7 associated pairs and their relative scores. If all the associated pairs are showing similar strength (either bullish or bearish) then this is either a good time to join the move, or alternatively it may be an opportunity to wait for a reversal in trend as the pair becomes overbought or oversold. The Quantum Currency Matrix gives you the tool to see the complexities of the Forex market in real time across all the related pairs, along with the strength of the buying and selling. Whilst it is possible to do this manually using multiple charts, what a manual matrix will not provide is any measure of the relative strength. The indicator does this for you automatically by considering the price action across all the related currency pairs and then deriving the relative strength scores accordingly. These are the ranking scores which you see displayed on each currency pair and by which they are ranked in the ladder. The Quantum Currency Matrix is a unique indicator. In an instant, you can see which pairs are rising strongly or falling strongly in every timeframe, and on a single chart. Whilst the Quantum Currency Strength Indicator gives you the heads up on individual currency strength and weakness, the Quantum Currency Matrix then delivers the global view for that currency in all the related pairs and for each timeframe – instantly, and giving you the tools to trade every pair with complete confidence. 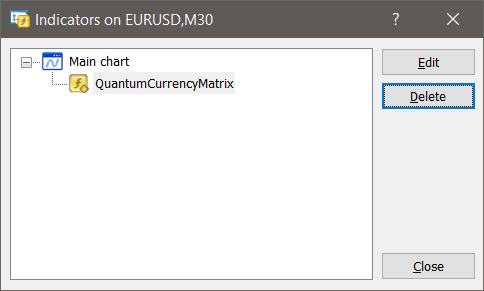 Your Quantum currency matrix indicator can be applied to any chart for any currency pair. The chart does not influence or affect the appearance or performance of the indicator. For example you can apply the indicator to a GBP/USD, a EUR/USD, or a USD/CHF, or any other pair. The indicator will display in an identical way on each chart. 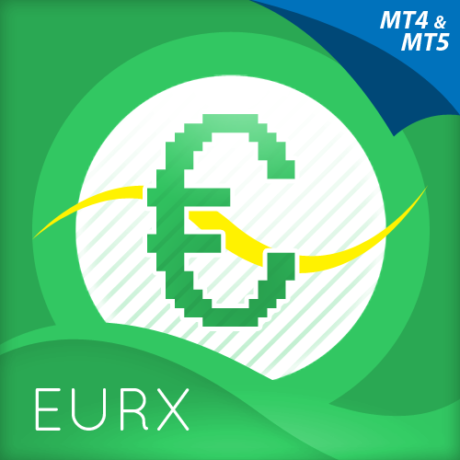 PLEASE NOTE: Many FX brokers deliver their MT4 platforms with unique currency pair notations, which vary from the standard notation which is a comma following the currency pair as shown here: EUR/USD,.M1 for example. These unique currency notations can be anything from a full stop, to colon, or letters and numbers, and can be either before the currency notation (which we call a ‘prefix’) or after the currency notation (which we call a ‘suffix’). In either case, the prefix or suffix will need to be added when configuring the indicator, otherwise it will not work. This is explained in the installation process below, and when any suffix or prefix is added it MUST be precise, and also include any spaces. 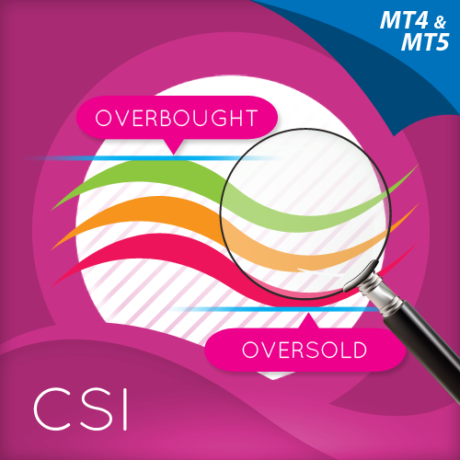 These four indicators then provide a unique and compact insight into all the various aspects of strength and weakness for both currencies and currency pairs, from trend and momentum to overbought and oversold. What is unique is that using four charts, you are then able to monitor the myriad combinations of strength, weakness, momentum, congestion and divergence across the entire forex complex at a click of a button. And even more powerfully, giving you the confidence to get in and stay in for maximum profits. No more missed opportunities, no more struggling with multiple charts, and no more trader regret, whatever your trading style or approach. 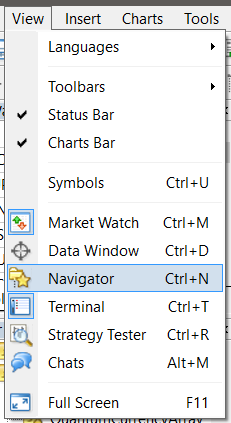 To start using the indicator, you can click and drag QuantumCurrencyMatrix from the Navigator to a chart or you can also double-click QuantumCurrencyMatrix (which will then be applied to the currently selected chart). Doing either one of these will display the Custom Indicator window where you can configure all the various user settings for your Quantum Currency Matrix. These options are grouped and can be accessed by selecting the tabs which will be discussed further in the following sections. Once you are done customizing the indicator’s options, click OK to run the indicator. You can configure the indicator by changing its variables listed in this tab. We explain each in detail shortly, and below are all the inputs for the Quantum Currency Matrix. The Quantum Currency Matrix uses graphical objects instead of plot lines so this tab is empty. 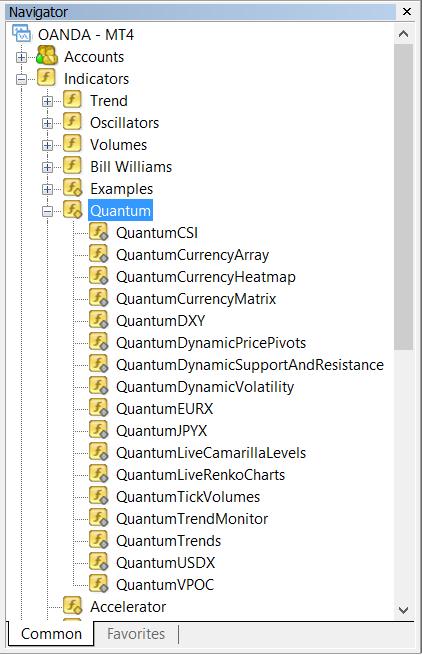 Let’s return to the Inputs tab and explain how to customize the settings of your Quantum Currency Matrix indicator. 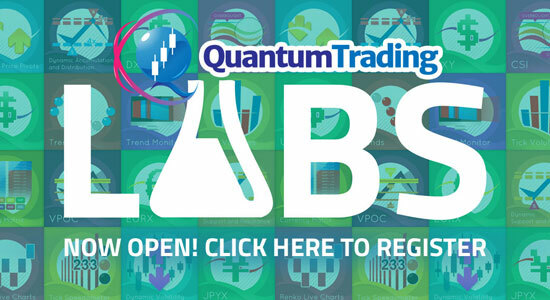 When running the Quantum Currency Matrix for the first time in your trading account, you need to enter the email you used to register in the Quantum Trading Indicators Enablement System – http://enable.quantumtrading.com/ as part of its verification process. You only need to do this once as the email is stored in the terminal’s global variable cache after it is entered initially. Please make sure that you enter your email correctly and exactly without any extra spaces before and after it. If you made an error, simply fill this field again to update it. This is the number of bars that the indicator processes during the calculation up to the most current bar. 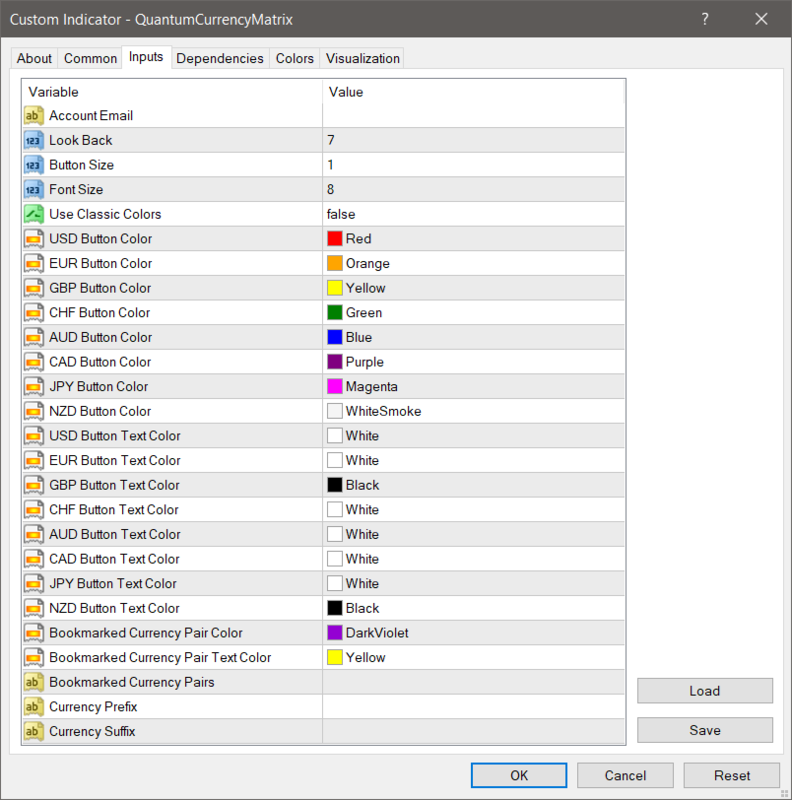 The Quantum Currency Matrix indicator requires a significant amount of processing power compared to most indicators, and this is the recommended setting. The higher the setting then the more processing power is required and we suggest it remains at 7, although you can change this if you wish. You can change the size of the toggle buttons and the table by changing this setting. This is especially useful for screens with very low or very high resolutions. Its default value is 1 but you can enter negative values to decrease their size further. You can change the size of the text by changing this setting. Its default value is 8 (it can only hold positive values). Instead of using a Green-Red gradient, the indicator switches to a dual color scheme when this setting is true. When using classic colors, all currency pairs with a performance score above 0 are blue and those below it are red. This is set to false by default. This setting defines the color of the USD button. Its default color is red. This setting defines the color of the EUR button. Its default color is orange. This setting defines the color of the GBP button. Its default color is yellow. This setting defines the color of the CHF button. Its default color is green. This setting defines the color of the AUD button. Its default color is blue. This setting defines the color of the CAD button. Its default color is purple. This setting defines the color of the JPY button. Its default color is magenta. This setting defines the color of the NZD button. Its default color is whitesmoke. You can change USD’s button text color from the default white to any color you like. You can change EUR’s button text color from the default white to any color you like. You can change GBP’s button text color from the default black to any color you like. You can change CHF’s button text color from the default white to any color you like. You can change AUD’s button text color from the default white to any color you like. You can change CAD’s button text color from the default white to any color you like. You can change JPY’s button text color from the default white to any color you like. You can change NZD’s button text color from the default black to any color you like. 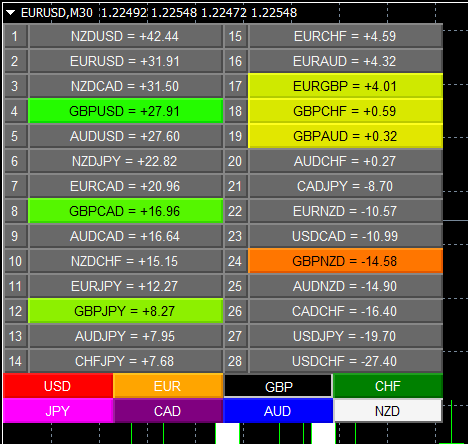 All bookmarked currency pairs are given a different color so you can see them easily in the constantly changing list. They are also not affected by the currency filters. 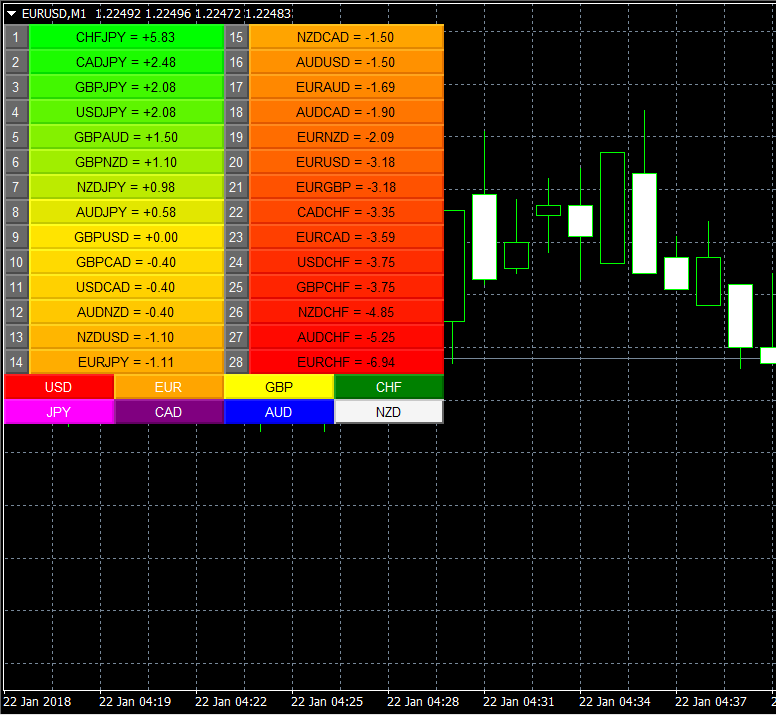 The indicator gives you the option to change the cell color of the bookmarked currency pair(s). 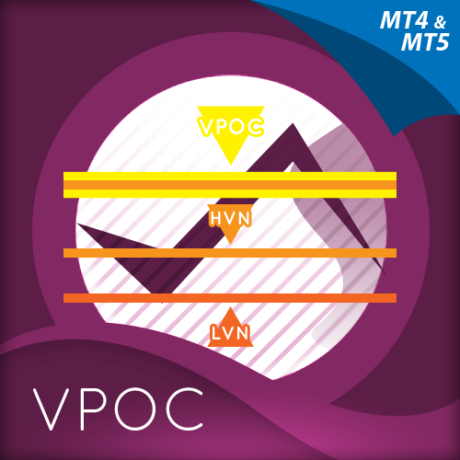 It is set to darkviolet by default but you can choose any color available in MT4. 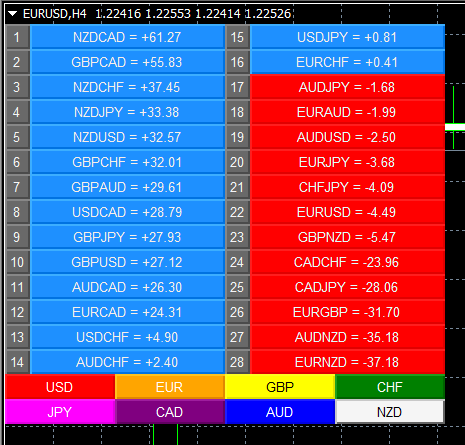 The indicator also gives you the option to change the text color of the bookmarked currency pair(s). 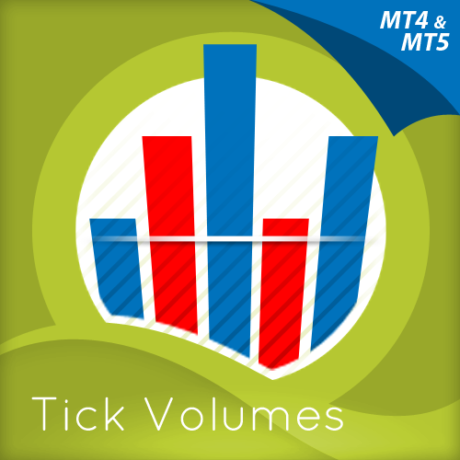 It is set to yellow by default but you can choose any color available in MT4. Just make sure to pick something in contrast with its cell color. The currency buttons are the colored buttons located at the bottom of the table of the Currency Matrix. This is used to filter out the currency pairs that contain the selected currency. Only one currency can be selected at any time. A currency is selected if its button is pressed. This filters out all the currency pairs containing the selected currency. 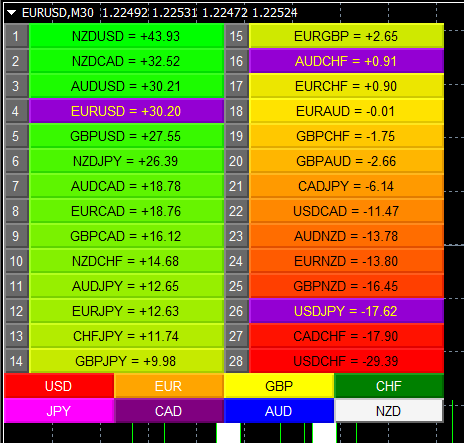 In the table, currency pairs matching the filter are colored while the rest are gray (except for bookmarked currency pairs). This way, you can easily focus on a currency conveniently. Also, your toggled buttons are saved so you can be sure that the same buttons are pressed when you reopen your MT4 terminal. 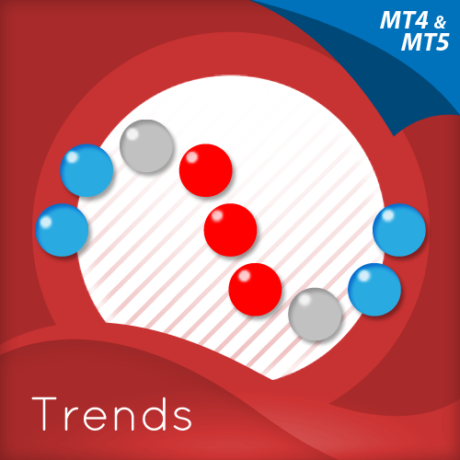 Select QuantumCurrencyMatrix and click the Delete button then click the Close button.